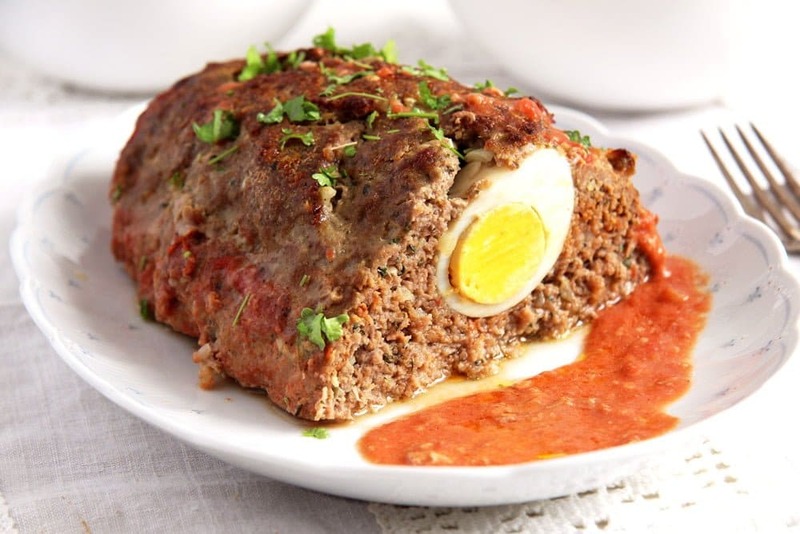 Juicy meatloaf stuffed with hard boiled eggs. But I am glad I did get to make this Easy Beef Meatloaf with Hard Boiled Eggs. It was a happy coincidence of me finding this recipe in one of my notebooks and having an abundance of eggs in the house. I wrote this recipe there in 2004 from a Romanian cookbook I borrowed from a friend (unfortunately I have no idea who wrote that book, I just scribbled down some recipes without bothering about the author). I remember the year so well, because it was the first time I went back home after actually moving to Germany, I could not cook much yet and spent a lot of time writing down some of my grandmother’s recipes and those found in Irina’s cookbook. 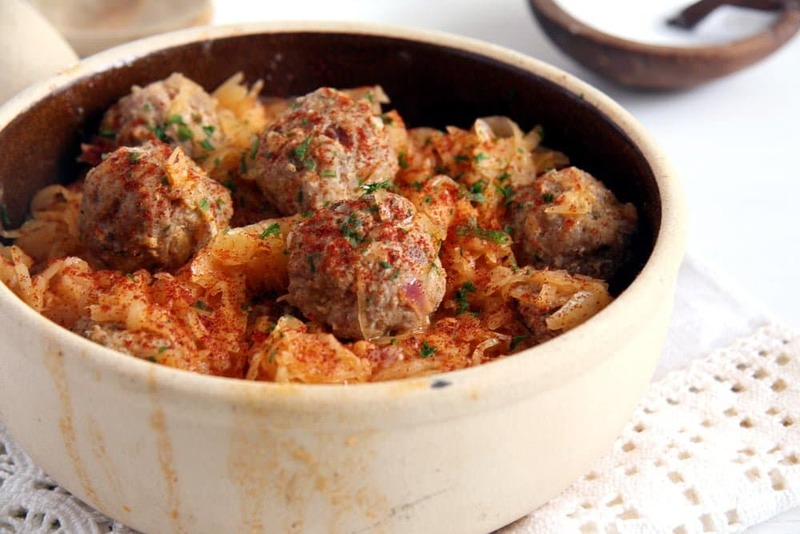 Although this is a recipe found in an old Romanian cookbook, I realize that meatloaf is one of those international recipes that seem to exist in lots of other countries. We have the Falscher Hase in Germany for instance and I have seen many American, British, Italian or Greek recipes for meatloaf as well. To boil the eggs place them in a small pot, cover with water, add some salt and bring to a boil. Turn off the heat and let the eggs stand, covered, for 12 minutes. Drain and rinse well with cold water. Let get cold and peel. Break the rolls or white bread into small pieces and soak in the milk. 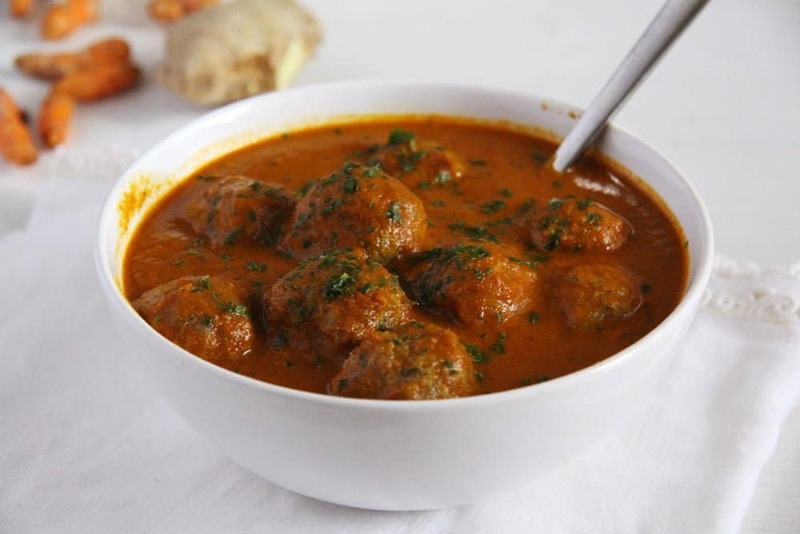 Place the ground meat in a large bowl. Add the very finely chopped onions, soaked bread, grated garlic, the two raw eggs, dry herbs, chopped parsley, paprika powder, salt and pepper. Mix well with your hand. Place about half of the meat in a roasting tin, form a long shape of about 23 cm/ 9 inch, arrange the hard-boiled eggs on top and cover with the rest of the meatloaf mixture. Give the meatloaf a nice form, oiling your hands lightly for this purpose. Pour the canned tomatoes and the oil around the meatloaf, add some salt, pepper and more dried herbs and bake for 40 to 60 minutes or until the juices run clear. Let rest for about 15 minutes and serve with potatoes and vegetables or salad of choice. 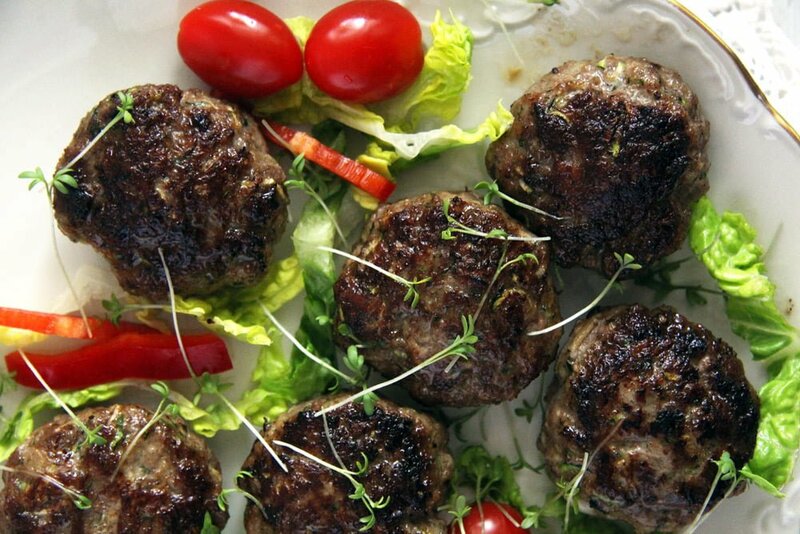 My husband loves meatloaf, frikadellen, meatballs…you name it. I used to make falscher Hase very often for him, but he complained about the eggs inside (he only eats eggs with runny yolk)..so now I just simply make Hackbraten. Amazing recipe and a must try for me. Love the eggs in there. Growing up meatloaf was one of my favorites! But I have to admit, I haven’t had it in YEARS. I’m loving this one! 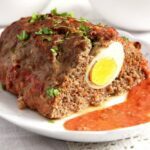 It’s kinda like Scotch eggs in meatloaf form! So clever! Cheers! This looks absolutely delicious! I’m the same way, I rarely ever make meatloaf but when I do it’s such a treat. I will have to try your recipe! Adina: This looks simply fantastic. In Southern Brazil where there is a lot of German immigrants, the meatloaf is stuffed with boiled eggs and topped with bacon. A similar recipe is on my blog too. My children and I are fans of it! 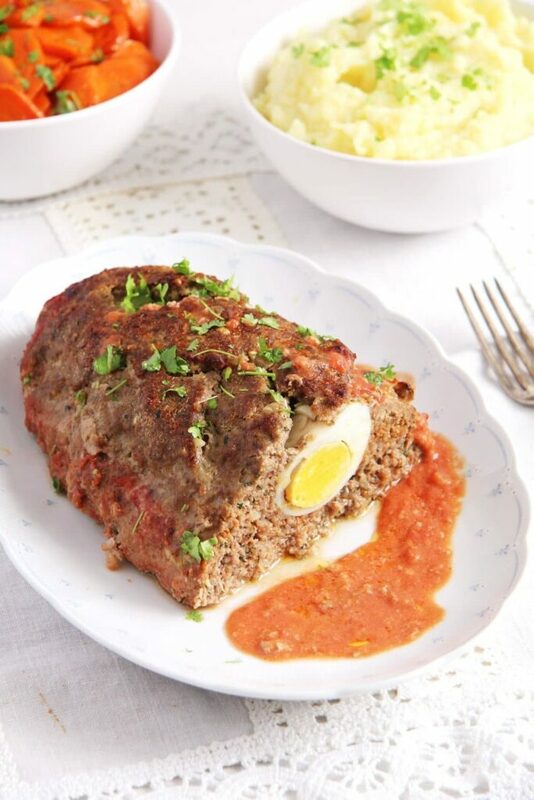 I love the surprise of an egg in the meatloaf! A perfect Easter week supper! El pastel de carne se ve jugoso y tentador y como siempre todo perfecto ,mi paladar sufre mirando ricas comidas y sabrosas,saludos y abrazos. 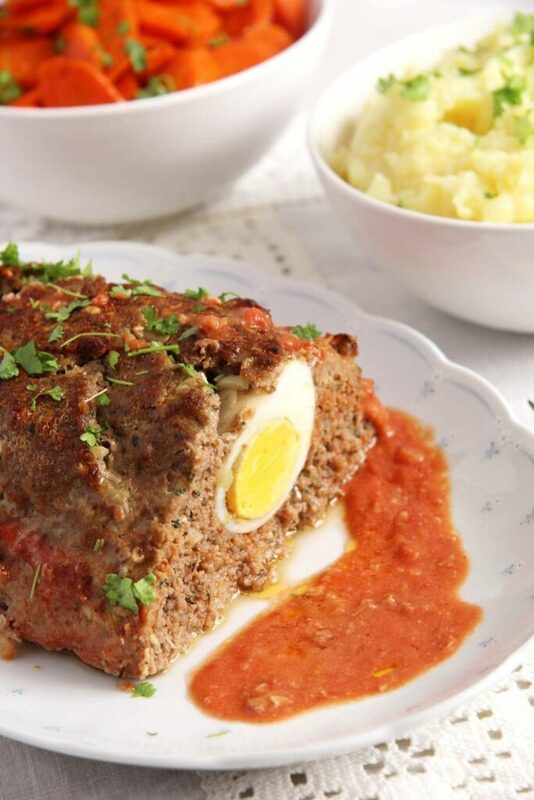 When I was younger, I used to not be a huge fan of meatloaf but, when my mom would stuck an egg in it, I loved it! 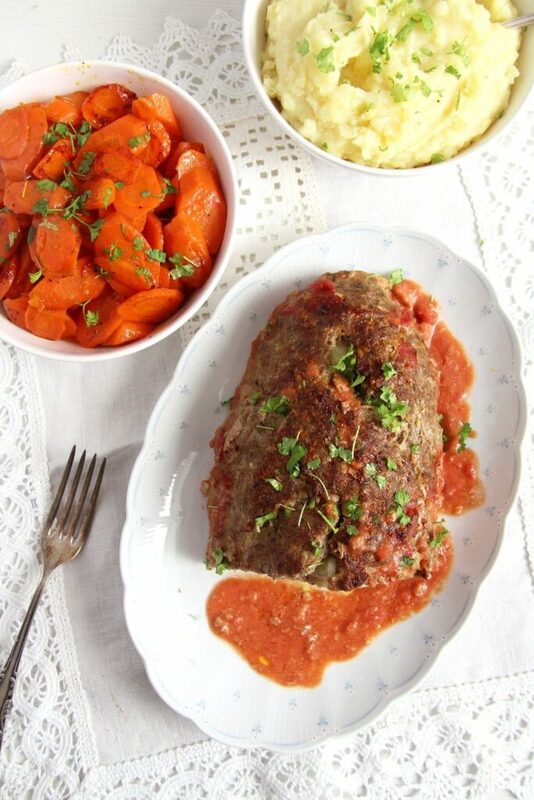 Your meatloaf reminded me of that bit of my childhood – thank you! Glad I stumbled by here today. Hope you have a wonderful rest of the week. I love meatloaf but have never made it with eggs. I usually make it with ketchup and cheerios which is fun and tasty! This seems so yummy! It’s so mouthwatering, Adina! Gorgeous Easter dish, Adina! I must remember your recipe for next Easter. Especially if it’s easy! My Mom and her Mom and so on have made meatloaf with ground beef and pork saug. corn flakes and boiled eggs in the middle. Now I am the last to have all the recipes to pass on but it is hard since none of them ever measured and I want to write it all down and make a family cookbook.